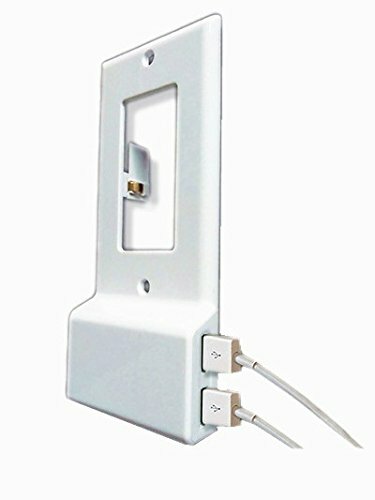 Stonepack creative solutions to upgrade your outlets - Wall plate replacement for the US Decor tpye, update your wall plate with 2 Smart USB Charging Ports. Every family need more and more USB devices nowadays, so some USB COMPATIBLE outlets are necessory to charge the smartphones, tablets such as an iPhone, iPad and cellphone, lamp, Bluetooth speaker, GPS and Power bank, etc. When you charge the electronic items, you need only some cables instead of USB charger. Simply remove your current cover plate and replace with the Stonepack USB Cover Plate and Charger. All that is needed is a screwdriver and DIY. 1. Power off the switch, and Remove the outlet's cover plate. 2. Insert the Stonepack wall plate with usb charger into the outlet, make sure the power prongs contact the outlet's conductor well.